The emergence of cloud, SaaS and mobile solutions presents a challenge for traditional enterprises. 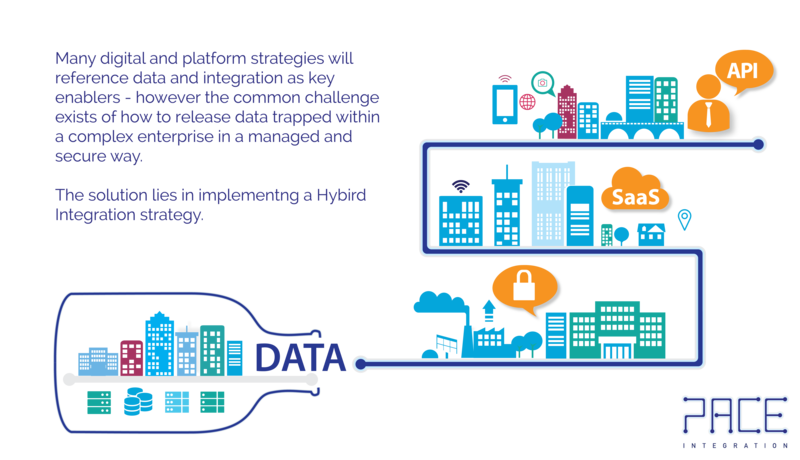 Your Integration platform needs to support Hybrid solutions that adapt to varied business requirements. Pace Integration can help you develop a clear integration strategy that solves these challenges. With the majority of application landscapes, organically grown, you need to start your API journey and unlock the various layers within your enterprise. You may start by creating an API that releases the necessary amount of master data from your Systems of Record in a secure way, then moving onto composite APIs that make this more business friendly. Finally you can create specific and lightweight APIs to accelerate consumption by a smaller application or mobile consumers. With an estimated 26 billion intelligent devices predicted by 2020 - Integration to play increasingly important role in your digital strategy. Contact PACE to understand how we can help shape this journey and unlock your enterprise. Talk to your leadership about these integration opportunities to accelerate your Integration journey in enabling your Digital Strategy and driving business value. With the PACE of change in technology increasing it is the perfect to time to review or define your Integration Strategy to ensure you can meet the business needs today and enable future growth through connectivity. See how these can be accelerated through seamless enterprise integration. Learn how API integration is providing the backbone for disruptive technologies, opening up existing data silos to increase speed to market as well as customer and employee engagement. The ability for your organisation to consume and publish APIs is critical in the digital ecosystem. There are organisational and delivery challenges to traditional IT departments, that are engrained in the DNA of your company. Evolving business expectations to increase the speed of innovation and differentiation, whilst still protecting the integrity and security of your systems of record need to be balanced. Understand how to achieve this within your integration platforms meeting the need for agility and security, supporting multi-mode IT delivery. Applying the right amount of Governance to your integration estate is critical across both federated and centralised organisations. Care is required to avoid isolating knowledge within one team but instead empowering your organisation to live your integration strategy across the business, IT and cross-domain projects. This requires new thinking and a different way to communicate and develop assets to leverage the most out of your Integration platform. With over ten years experience in Integration delivery see how PACE can propose opportunities to streamline delivery and help get you back on track. Whether it's traditional waterfall delivery or agile project methodologies like scrum we can help you put in place the right framework for success. PACE is able to both accelerate delivery and de-risk key programmes by applying proven best practises, working with your delivery partners. As Integration practitioners we all understand it, but let PACE help you market the true value of integration to stakeholders, partners, consumers. With our passion for integration, establish a strong Integration brand to make it relate to those who don't speak Integration. From both the foundational concepts to more advanced topics we can ensure the value of integration is recognised. At PACE we're committed to enabling our clients to deliver sustainable success; we can offer packages tailored to whatever stage you are on your integration journey. Our foundation services allow you to understand where integration fits into your overall digital and technology strategy or how an API platform can open new disruptive markets. Enable measurable opportunities for growth with integration; from jump-starting your Integration Strategy, establishing a Integration Competency with scalable governance for multi-modal management, or embedding a new integration platform. Our collaboration services are tailored to working alongside your team in delivering that niche line of business architecture, that critical programme, or running that vendor selection process. No matter where you are on your integration journey Pace Integration can help.